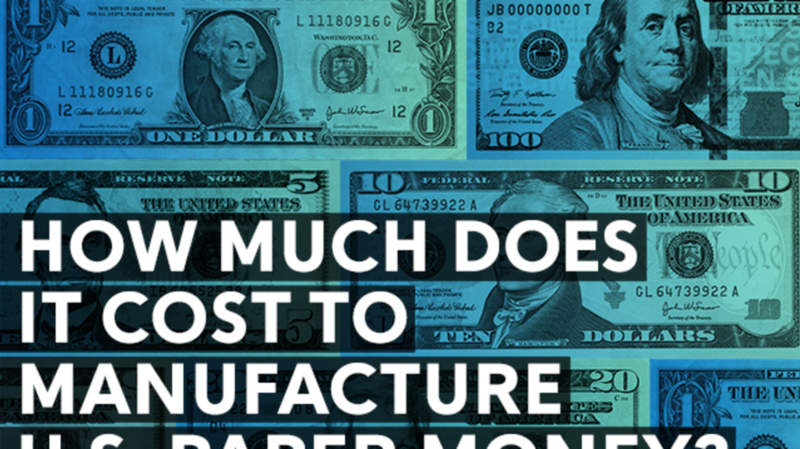 How Much Does it Cost to Manufacture U.S. Paper Money? To make money, you gotta spend money—and no one does this to better effect than the Federal Reserve. In fiscal year 2014, the Bureau of Engraving and Printing created 6.9 billion paper notes, with a total value of $130.1 billion, which adds up to about 24.8 million notes a day. That might seem like an enormous amount to be adding to the pool, but in fact, more than 90 percent of the notes are used to replace ones already in circulation (or recently taken out). It never stops, either: In the current fiscal year, the BEP plans on making 7.2 billion notes, valued at $188.7 billion, a 20 percent increase from last year. It’s just a fraction of the total amount of money currently circulating—about $1.37 trillion as of June 4, 2015—of which $1.32 trillion was in Federal Reserve notes. So how much money is it costing the government to produce all that dough? Well, $1 and $2 bills cost 4.9 cents per note to make, while $5 cost 10.9 cents, $10 cost 10.3 cents, both $20 and $50 bills cost 10.5 cents, and $100 bills cost 12.3 cents. In other words, the more it’s worth, the more it costs to produce. While each individual note costs a fraction of what it's worth to produce, those bills do add up. Not to mention raw materials: Between the facilities in Fort Worth and Washington D.C., about 8.9 tons of ink was used each day in the last fiscal year. When it’s all said and done, if the new currency budget is an accurate prediction, the Fed will spend about $717.9 million this year alone. (And yes, the $10,000 bill is a real thing. It's officially still legal tender, but the Fed discontinued them in 1969).